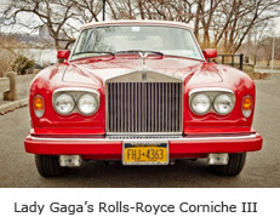 Julien’s Auctions, renowned auction house to the stars, has announced the exclusive auction of multi-platinum selling and GRAMMY winning artist Lady Gaga's Rolls-Royce Corniche III on Saturday, May 17, 2014 in New York. The auction will take place at Hard Rock New York – Times Square. The auction will benefit MusiCares. The red 1990 Rolls-Royce Corniche III convertible to be offered for the first time was owned by Lady Gaga and used by her publicaly to travel to the Guggenheim Museum in September 2012. It is estimated at $30,000-$50,000. Lady Gaga is recognized for her diverse contributions to music through her performances, fashion and music videos. She has sold more than 125 million singles worldwide and over 25 million albums. 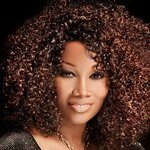 She has won five GRAMMY Awards and 13 MTV Video Music Awards among many other achievements. She has been named to TIME magazine’s Most Influential People list and has consecutively appeared on Billboard’s Artist of the Year list. She also is ranked fourth in VH1’s list of 100 Greatest Women in Music and is included by Forbes magazine in the World’s 100 Most Powerful Women list from 2010-2013. She also is the current face of the House of Versace and an activist for equality. Lady Gaga, who just kicked off the North American leg of her ARTRave: The ARTPOP Ball global tour, is offering 100 percent of the sale of this extraordinary automobile to MusiCares. As the charitable arm of the National Academy of Recording Arts & Sciences, MusiCares provides a safety net of critical assistance for music people in times of need. MusiCares’ services and resources cover a wide range of financial emergencies, and each case is treated with integrity and confidentiality. MusiCares also focuses the resources and attention of the music industry on human services issues that directly impact the health and welfare of the music community. The Rolls-Royce Corniche III will be on display at the Hard Rock New York – Times Square from Monday May 12, 2014 through Saturday, May 17, 2014 prior it to being auctioned during the Julien’s Auctions Music Icons auction event to be held May 17, 2014 at the Hard Rock New York.